Early this week, Facebook announced that it would acquire Oculus Virtual Reality, the creators of Oculus Rift for $2 Billion. 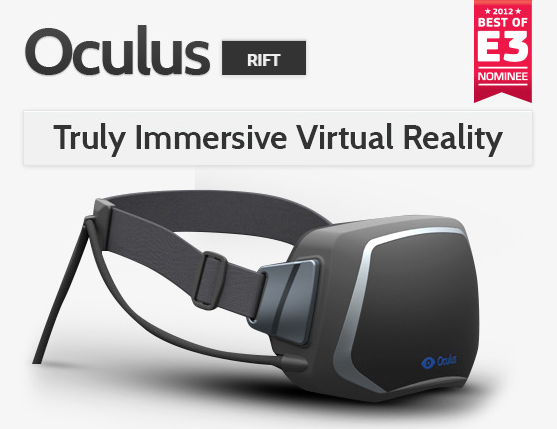 Oculus Rift (or “Rift” to those in the know and proud of the dorky name), is a virtual reality headset designed by then 19 year old Palmer Luckey, a virtual reality lover and taker-aparter-of-things sort of inventor. For many people this acquisition move came as a surprise—especially the Kickstarter supporters who helped the company launch two years ago with a pledged $2,437,429—far exceeding the Kickstarter goal of $250,000. Why would Facebook want a company focused on virtual gaming? Instant field trips for classes of kids to go look at other countries. And as an advertising company, we have to go there—how will companies take advantage of this new medium? When you consider how businesses jumped into Second Life, the virtual world (Best Buy established a “Geek Squad” island, American Apparel opened a store), it isn’t even close to a stretch to see that companies will be cleverly figuring out how to make Rift work for them. Give People a Thrill. If your company or product is associated with action or adventure in any way, give the people some action. Sporting goods stores like REI could have their own Oculus Rift and offer customers a chance to base jump or hike or climb. Real Estate Tours. Builders can allow you to walk through the floorplan of a home that isn’t built yet. People can visit your community from across the country or even the globe to see what the area is like. Sample Your Travel. Playing off of the “virtual vacation” idea of a potential social experience, companies like Apple, hotel chains, or any tourism chain can give people a taste of what their experience is like. Show off a sunset, how close breaching whales come to a cruise ship, or a ski run down the slopes. How It’s Made Tours. If your production process is interesting or educational, give your consumers an inside look on how things are made. Beer companies can offer brewery tours. Playing off the “field trip” idea, Got Milk could offer a “where does the milk come from” field trip. Of course, it’s fun to speculate when the technology is just being launched. All of this depends on the widespread adoption of the medium, and whether Zuckerberg is right to foresee this as the future. I will leave you with this. While some these ideas are exciting, let’s hope it doesn’t all go too far. I catch myself zoning into my phone far too often to not be afraid. The idea of a virtual social future has the potential to take us somewhere I don’t want to go. The Time article quotes the Oculus CEO: “When you add other people to it,” Iribe says, “and you can actually see somebody in that place and you can make eye contact, and you can look at them and they can look around, you can now have this shared sense of presence in this new gaming experience, entertainment experience or just social experience that really starts to define what virtual reality is all about.” I cannot help but be a little frightened by this vision, which makes me recall “Surrogates,” the 2009 Bruce Willis movie about people who live in their houses, holed up on virtual reality sets, making Avatars walk around the virtual world and do the living for them. Or Disney/Pixar’s Wall-E, which predicts a future where the human body becomes a blob and where we forget to actually look up at the real world around us anymore. Could this be our future? What other ways might advertisers use Virtual Reality and the Rift?